You are here: Home / Oregon Nursery Country / Fessler Nursery Co.
Annuals, including more than 100 varieties of fuschias, are the forte at this nursery in Woodburn, Oregon. You can find Ken Fessler in the greenhouse almost every day, still tending to the plants at the nursery he and his wife Marie founded in 1960. Though officially retired, Ken likes spending time there. And although Fessler Nursery Co. grows many varieties of annuals, annual liners, houseplants, tropical plants and holiday poinsettias across its 600,000 square feet of greenhouse space, the fuchsias happen to be his favorite. Fuchsias are only a part of what Fessler Nursery offers. The company is very diversified within the greenhouse space. The nursery grows rooted plugs and cuttings for Selecta One and Ball FloraPlant. These are available only through select brokers. Then there are the finished annuals, baskets and perennials, which are sold in spring and early summer to independent garden centers and local chain stores across the Pacific Northwest — as far north as Seattle, as far south as Eugene, Oregon, and as far east as Walla Walla, Washington. And finally, there are the tropical foliage plants and houseplants the company ships year-round to the big box stores and local retailers in Washington and Oregon. But let’s not forget about the poinsettias, which ship to retailers and community groups (as fundraisers) during November and December. 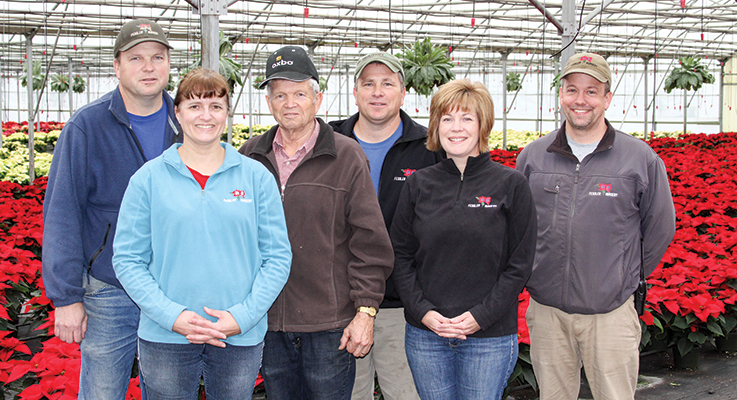 Although Fessler Nursery has become quite large, it’s still a family business through and through, with everyone pitching in. Three of Ken and Marie’s five children are involved in day-to-day management. Dale is in charge of tropical foliage and houseplants. Another son, Marvin, is in charge of the spring annuals. And daughter Debbie Farrell is the head of propagation. Marvin’s wife, Katy, is in charge of a seasonal retail operation that runs from April through June. Kyle Peterson serves as the nursery’s production manager. The roots of the nursery run deep in Oregon’s Willamette Valley. The Fessler family was among the early German settlers who founded the community of Mount Angel, which is well known for its annual Oktoberfest celebration. Ken grew up on farmland that’s located about halfway between Mount Angel and the larger community of Woodburn. His parents ran an orchard, grew berries and raised livestock. He was the oldest of four children. Among Ken’s siblings is his younger brother Bob, who would go on to start Woodburn Nursery & Azaleas on an adjacent piece of property. Ken graduated from high school in 1958 and married Marie in 1960. He took a six-month, unpaid internship with Oregon Nurseries Hall of Famer Joe Klupenger, at Klupenger’s Nursery, just to learn the basics of the business. With that under his belt, he founded Fessler Nursery that same year, on the same property where he was raised. Initially, he grew outdoor plants — camellias, spruces, pines and azaleas. But by 1965, the business took a different turn. Ken decided to grow geraniums and fuchsias. For that, he needed greenhouses — which was the whole idea. “He decided he didn’t like working outdoors in the weather,” his son Marvin said. The nursery grew steadily over the years, as Ken and Marie raised their five children. Dale went to work at the nursery in 1990. He was put in charge of florist azaleas. Marvin followed in 1996. Although he went to college and learned to be a construction engineer, he decided to come home to the farm. One of the changes Marvin made was to add delivery trucks. Until then, all finished plants had been sold on a will-call basis. He also lengthened the season — a step that helped retain workers full time, instead of having to do layoffs at the end of each season. “We’ve tried to fill in, so we have something going all year around,” Marvin said. Around 2004, Fessler Nursery discontinued its florist azaleas because they required too much time to grow and, with demand softening, they were not profitable. Instead, the company started offering tropical plants and houseplants. Like the florist azaleas, they could be grown and shipped year-round, but unlike them, they were in demand and profitable. Dale was put in charge of the new division. In 2006, the nursery was selected to grow rooted annual cuttings and plugs for Selecta One, becoming one of 15 rooting stations around the country. In 2008, Debbie came back to the nursery. She took over the plug program and became the nursery’s head propagator. She expanded the offerings by adding Ball Horticulture and Suntory. The plugs are sold exclusively through brokers, mostly to regional markets around the Pacific Northwest — Oregon, Washington, Idaho and Alaska. The Fesslers pride themselves on their responsible use of resources both natural and human. The nursery collects rainwater and groundwater for treatment and reuse, and makes use of energy efficiency measures, including double-wall greenhouses, high-efficiency heaters and boilers, and natural ventilation rather than fans. The property is short on well water, making the water treatment and reuse essential. The nursery strives to keep people on year-round as much as possible, and has invested in automation to get the most out of the workforce they have. But if there’s one value that exemplifies the Fesslers, it’s hard work. They share responsibilities, and if someone sees something that needs to be done, they just do it. “We care about the product we’re producing, we care about the customers we’re serving, and we do our best,” Marvin said.